Home Unlabelled PrecisionAir discontinues flights to Lubumbashi and Lusaka. PrecisionAir discontinues flights to Lubumbashi and Lusaka. Tanzania's premier airline Precision Air (PW) will discontinue flying to Lubumbashi and Lusaka effective 1st July 2013. This move comes one year since PW launched the Lubumbashi/Lusaka route with four flights a week using a Boeing B737-300. According to a notice issued to its business partners, the discontinuation of this route is part of the airline’s efforts to consolidate its strategic market presence and focus on growing strong domestic demand and other more lucrative markets. Customers who purchased tickets to fly to Lubumbashi/Lusaka with Precision Air after 30th June 2013, should expect to reach their final destinations through PW’s airline partners or receive full refund. PW’s move to stop operating to Lusaka will now leave an open route to Fastjet ,a low cost carrier that just last week got the rights to operate international flights from Tanzania, Lusaka being one of the destinations. 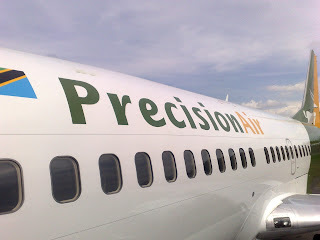 Precision air is the only airline in Tanzania listed on DSE and earlier this year was listed for the first time as Super brand in East Africa. Precision Air has the largest network than any other airline in Tanzania with operational stations in 18 destinations within and outside Tanzania with Dar es Salaam being its hub.